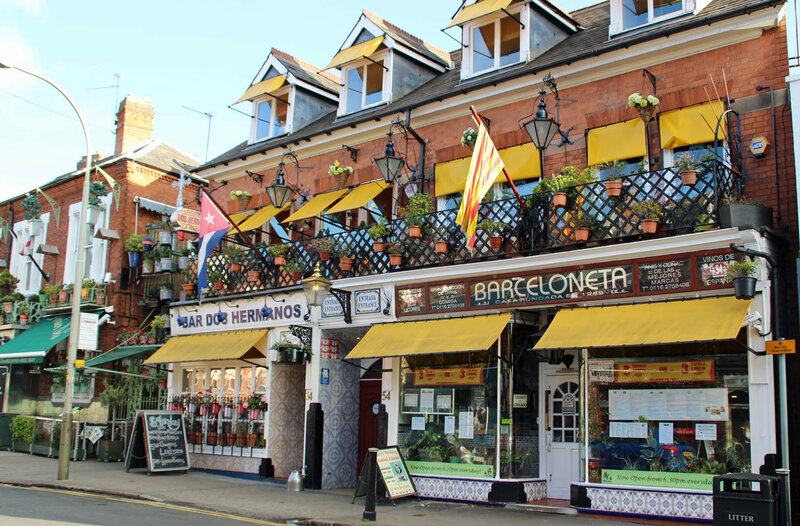 The colourful exteriors of Barceloneta and its neighbours, Salvador Deli and Bar Dos Hermanos, have over the years become synonymous with Queens Road itself. The three establishments are family-owned by the two brothers who give Bar Dos Hermanos its name and together they comprise something of a one-stop-shop for hungry and thirsty visitors. Everything from locally-sourced cheeses and other artisan delicacies to corned beef hash and Cuban-inspired cocktails are on offer behind the inviting facade. Barceloneta was established in 1990 and has been serving traditional Spanish dishes along with an extensive range of accompanying Iberian wines, liqueurs and aperitifs ever since. The speciality is tapas, a cuisine which has huge cultural importance in Spain, and everything about this restaurant reflects the joviality and informality inherent in this very relaxed style of dining. Anyway – back to the real world of LE2. My most recent visit to Barceloneta was with my mum and dad, who were visiting for the weekend, and my boyfriend Will. We booked our table for 7pm, a premature hour for dinner by continental standards, but the restaurant was already filling up when we got there and people who arrived after us without reservations were being turned away. Calling ahead is an absolute must at weekends and even on a week day it’s a wise thing to do – this is an extremely popular little eatery. The waiting staff are extremely friendly and happy to advise first-time diners on how to choose their dishes. Tapas is not compulsory – there are plenty of options for those who would prefer a more traditional starter and main course scenario – but it is very much the speciality and I do recommend that you give it a go. Two or three of the tapas dishes per person should be about right – pick a selection of meat, seafood and veggie options and dig in. The joy of tapas lies in the sheer variety of dishes you can sample in one sitting and for this reason the more people you visit with the better. It’s a very sociable way of eating which makes Barceloneta a brilliant venue for big groups and parties. Spain has seen tapas evolve throughout its history by incorporating influences and ingredients from a mix of different countries and cultures. Reflecting this, while Barceloneta’s dishes are primarily Spanish in origin, they take additional inspiration from elsewhere in the Mediterranean, including North Africa and Sicily. This cocktail of influences, combined with the Spanish chef’s commitment to using fresh, locally-sourced ingredients makes for an appealing, not to mention sizeable selection of plates to consider – leave yourself plenty of time to choose your dishes because it’s not easy! The complimentary bread to start is delicious and it’s a challenge not to polish it all off straight away, but you’ll be rewarded for keeping some aside with a whole host of delicious dipping opportunities in the bottom of every tapas dish. Our favourite plates were Champiñones Rellenos con Espinacas y Queso Azul – mushrooms stuffed with spinach and wonderfully strong Spanish cheese, and Croquetas de Cangrejo y Gambas – crab and prawn croquettes served with a zesty lemon mayonnaise. Make sure you supplement the more exotic dishes with some Spanish staples like the Tortilla Española, Calamares Fritos and one of the paellas. If you’re not a fan of garlic you’re going to struggle at Barceloneta – many of the dishes are humming with the stuff and it has a tendency to overwhelm the more delicately flavoured ingredients. Having said this, tapas isn’t really about delicacy, but more about big, strong flavours. With this in mind I would like to see a bit more boldness in the use of chilli and the gorgeous Spanish pepper pimento in Barceloneta’s dishes. Some of the tapas, most notably the Patatas Bravas and the Pollo al Chilindrón, are traditionally bold and spicy, but didn’t quite hit the mark. Presumably they are downsizing the spiciness to make the dishes more universal, but it would be nice to have one or two really fiery options on offer. The fish and seafood options are particularly good, and there are more than enough meat-free offerings to satisfy veggie tastes. Despite this, the health-conscious might be a bit put off by the number of dishes which are either fried or served in a large amount of oil. While there are salad dishes such as the Ensalata de Pimento y Tomate and the Ensalata de Tomate y Mozzerella, a visit to Barcelona might be a good opportunity to put the diet on hold for the evening and embrace all things buttery. Drinks-wise the rich and fruity sangria, which is a house speciality, is a hugely popular accompaniment. At £3.75 per glass or £12.95 per jug it’s also purse-friendly. For those who prefer their wine without added orange juice and random bits of fruit floating in it (I’m not a fan myself) there is a great selection of Spanish wines to suit a range of budgets. Many of the wines have been selected by the owners after personal visits to small Spanish vineyards. 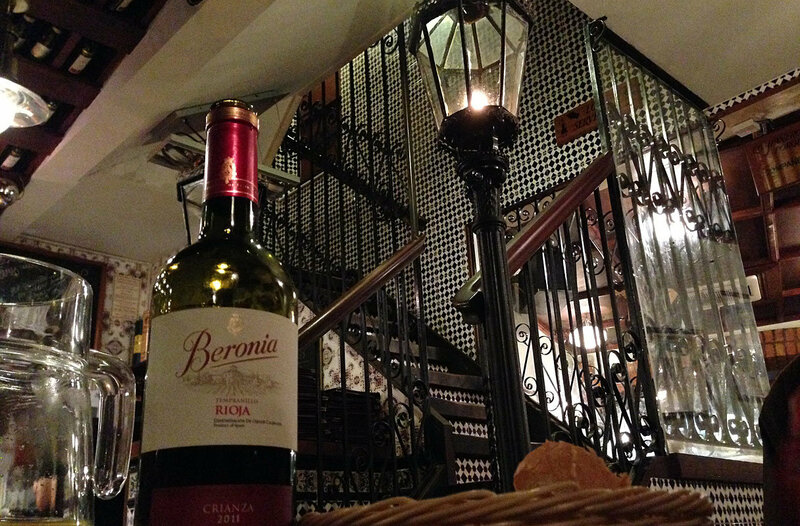 We got through a couple of bottles of Beronia Crianza Rioja, which at £16.95 was one of the more affordable options and is also available by the glass. It was a hugely tasty, full and fruity number which more than stood up to the garlicky onslaught. Beer drinkers can choose from a selection of European bottled beers, including Mahou – a light and refreshing brew similar to San Miguel. How we had room for dessert I’m not sure, but we persevered and opted to share a portion of truly decadent Churros (Spanish style doughnuts) with warm chocolate sauce. Other options include Tarta de Chocolate al Brandy and Homemade Treacle and Mango Sponge, both of which speak for themselves and look every bit as indulgent as they sound. I’ve also heard good things about the cheeseboard, which is updated regularly with a range of fine artisan offerings. 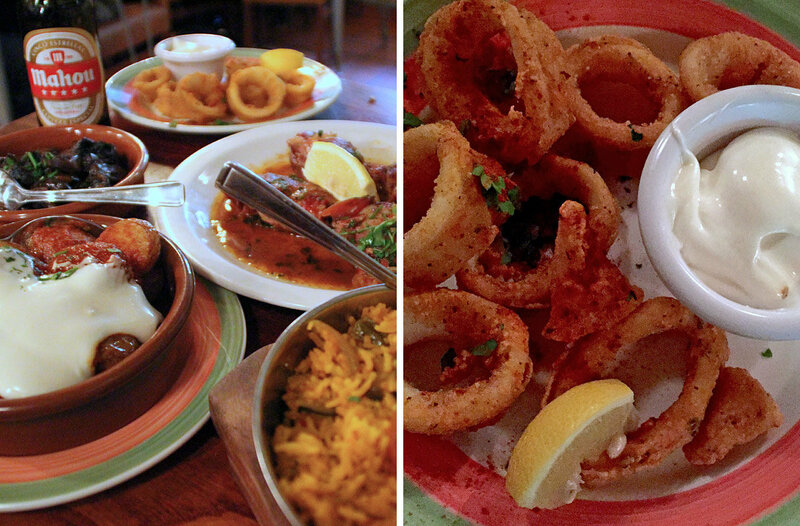 At between £3 and £7 for a tapas dish, Barceloneta is about mid-range in terms of price. Having said this it’s easy to get carried away and order more dishes than you can eat! If you’re on a budget a policy of ordering several ‘staples’ like rice and a just a couple of the more exotic, pricey options should make sure you end up full-up without blowing the budget. We spent around £30 each, which included half a bottle of wine per person and as much tapas as we could eat, as well as a bit of dessert, which isn’t bad at all. It’s also worth bearing in mind that there are special offers on Sunday, Monday and Tuesday evenings and a dedicated ‘party menu’, each of which get you a bit more pimento for your pound. The service is friendly and speedy. Many of the waiting staff have been working here for a while and will also be familiar to anyone who frequents Bar Dos next door. It’s clear that the whole operation has been well-honed with the kitchen and the front of house team working harmoniously together to deliver an unhurried but efficient service to diners. Barceloneta is an informal, characterful restaurant which is perfect for a relaxed dinner for two, while the inherently sociable element of tapas dining makes it an equally good choice for a larger group. I feel extremely lucky to have this place practically on my doorstep. It’s the default dining option when people come to stay with us because of the quirky decor, the friendly staff and the universal appeal of the food. Inevitably the chef’s commitment to catering for all tastes leads to some of the dishes lacking the hot and hearty flavours you’d get in an Andalucian tasca, but this my only real criticism. When it comes to authentic European food served in a relaxed and welcoming environment, there aren’t many Leicester restaurants which can compete with Barceloneta.